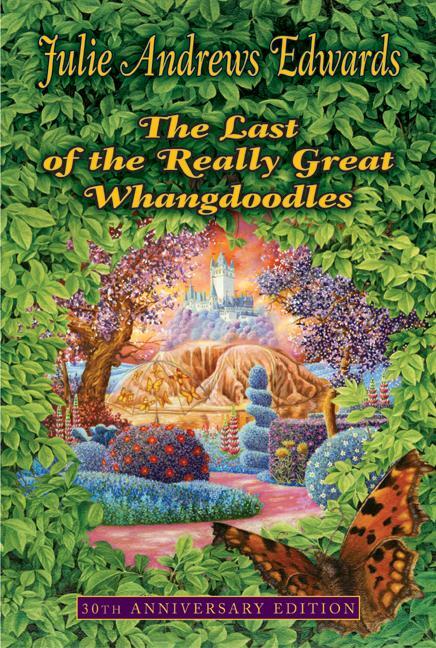 This last week I have been reading something good, a book that a friend recently gave me called The Last of the Really Great Whangdoogles by a children’s writer named Julie Andrews Edwards. I had never heard of it before, I’m about five chapters in now, and it’s completely wonderful. It’s in the category of “books for children”, but it also contains all sorts of ideas you’d never expect in a children’s book, such as a really excellent treatise on Fractal geometry and its place in the world – even though the book was published a year before Benoit Mandelbrot had even coined that term. Today a woman whom I had never before met asked me what books I am reading, and I pulled the Whangdoodle book out of my coat pocket and showed it to her. She looked at the author’s name and said “Oh, Julie Andrews, the actress?” Even as I was starting to roll my eyes at her unjustified leap of logic, she was already looking at the author’s photo on the back of the book – something it had never occurred to me to do. Sure enough, the author was indeed Julie Andrews, the actress. I’m guessing now that the friend who gave me the book had assumed that I knew that the author was Julie Andrews, the actress. One thing that makes this story so uncanny is that just this morning, about an hour before the abovementioned encounter, I had read the New York Times book review of the new autobiography of Julie Andrews (yes, the actress). The review mentioned that she was also a respected children’s writer, and yet even that hadn’t clued me in. It fascinates me that it had simply never occurred to me to make the connection between writer and actress – I guess my mind just doesn’t work that way – and yet the very first person to whom I showed the book made that connection instantly. Yet now that I know this, my mind has been starting to make all sorts of other connections. There is, for example, the coincidental fact that just this week I gave a gift of the DVD of The Sound of Music to perhaps the only friend I know who has never seen it (and in fact hadn’t even known the film existed until I had described it). I guess I had felt it was my civic duty to spread universal knowledge of Rodgers and Hammerstein’s classic creation. 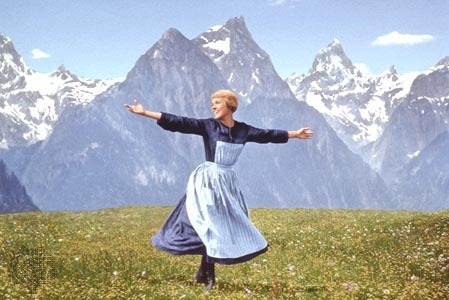 So of course I had been looking at that famous picture of Julie Andrews in the Austrian Alps at the same time that I was reading her book, all the while oblivious to the author’s identity. But there’s one other connection that comes to mind, stemming from the time several years ago when I was browsing through the Strand book store on Broadway and 12th Street. The Strand is the perfect place to find that book you’ve been looking for all your life which you never knew existed. And that’s what happened on that day. I found the autobiography of Alan Jay Lerner, the lyricist for My Fair Lady – a musical that I mentioned in this blog only yesterday – which first opened on Broadway in 1956. When people think of this musical adaptation of George Bernard Shaw’s play Pygmalion, Julie Andrews generally comes up merely as the young engenue who rose to sudden stardom playing the lead part. 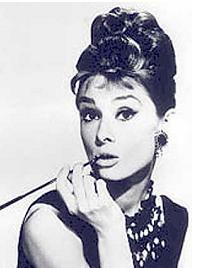 But according to Lerner’s autobiography, Ms. Andrews also played a far more significant role in this musical’s evolution. Anyway, back to 1956. Lerner had written his adaptation – which I think is one of the greatest musical adaptations of a play ever written – in a way that was fairly true to the spirit of Shaw’s original. Pygmalion was not merely a romantic comedy; it was a socialist critique of the British class system. In a nutshell: Henry Higgins, on a bet, trains guttersnipe Eliza Doolittle to speak “proper” english. Comic romance ensues, as the battle of the sexes merges with the battle of the classes. Those who have only seen the musical version may not realize that at the end of the original play, having acquired the language tools required to rise up from the streets, Eliza does not, in fact, marry Higgins. 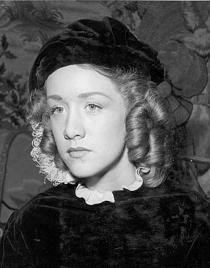 Shaw specified that a note be placed in each theatre goer’s playbill, explaining that in fact Eliza, being a sensible young woman, will go on to marry the insipid Freddy, a rich young man who dotes on her, so that she can use his money and her newly empowering language skills to open a lucrative London flower shop. Lerner had written his musical adaptation to conform to Shaw’s ending. As in the play, Higgins commands: “Eliza, fetch my slippers!” at which point she walks out on him. All of which is consistent with Shaw’s intended message. Well, according to Lerner’s autobiography, on opening night Julie Andrews couldn’t bring herself to do such a thing. Instead, she came back on-stage carrying the slippers, and the audience went wild. Everyone left the theatre happy, the opening was a smash success, and the producers decided to go with the new ending. This entry was posted on Saturday, March 29th, 2008 at 11:38 am	and is filed under Uncategorized. You can follow any responses to this entry through the RSS 2.0 feed. You can leave a response, or trackback from your own site.